I love decorating my Christmas tree. In fact I love it so much I usually decorate 5 Christmas trees. One in the living room, family room and each of the three kid bedrooms. I often have friends ask me how I decorate my tree. Some years I even have an audience because they want to watch me do it. I put them to work though! They get to help fluff and hand me things. So I thought I’d share with all of you how I decorate my tree. I know for many of you this will be too late for this year but if you like you can pin it for next year. We have an artificial tree. I realize that is a bit sacrilegious here in the beautiful, evergreen full Northwest but I got tired of trying to find the perfect tree each year and then having to string it with lights. The lights became my job when I realized my husband thought one string of lights should be enough to cover the whole tree. The thing I love most about my artificial tree is that the lights are already on it except this year when half of them decided not to work. Due to husband’s eye surgery he was unable to help so I had to deal with it. Let’s just say I was not a happy camper! The tree almost ended up out on the curb and there might have been some ranting and raving going on but where there is a will there is a way and I got it figured out. Let’s just say you really should unplug the lights before you decide to cut them off the tree!! 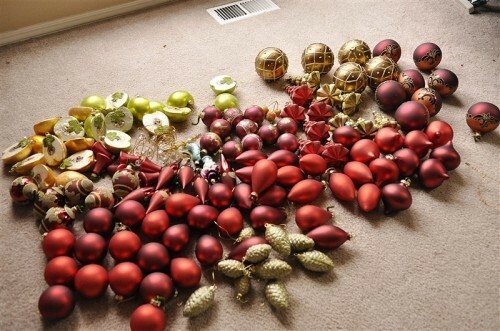 So today I am going to share with you how I decorate my Christmas trees. If you have any helpful tips or ideas please leave them in the comments. Of course questions are welcome too! I do have to say that the biggest trick to having a beautiful, full tree is having a lot of stuff to put on the tree. But even if you don’t have a lot you can still have a lovely tree and remember I’ve been collecting stuff for thirty years! After Christmas sales are a great way to grow that collection. 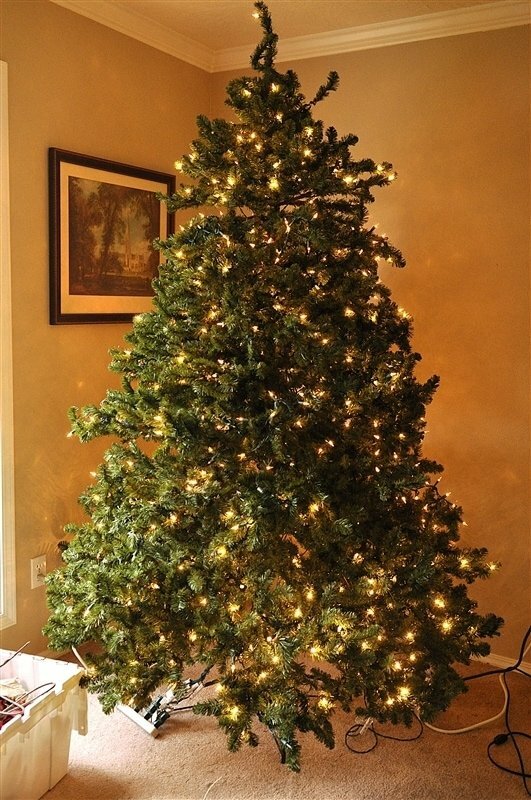 Step One: After setting up the tree and lights are added make sure you fluff (this only applies to an artificial tree) The branches have gotten smooshed while its been packed away so fluff those little branches! Step Two: I like to add some “filler” garlands into my tree. I push them back towards the center and it helps add depth and fill up any big “empty” spaces you may have. Especially on a live tree where the branches may not be perfectly even. I have 3 of these on my tree. My tree is 7.5 feet (we have low ceilings). They are each about four feet long. I just push them into the tree. Step Three: I don’t just put ornaments on my tree. I have quite a bit of other decor such as flowers and fruit swags. I just insert these fruit swags on to the branches. Just push them in. 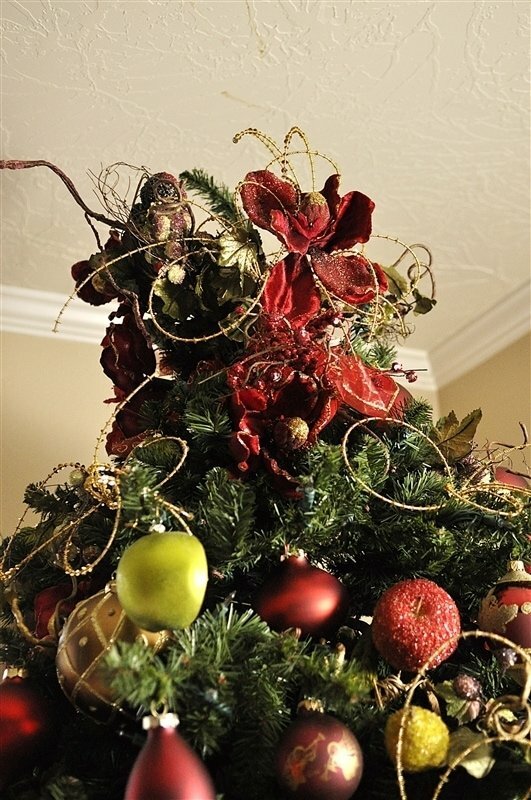 Be sure and step back occasionally to make sure that you are placing them evenly throughout the tree. I then add in my flowers. I have about 20 poinsettia flowers that I add into my tree – again placing them evenly throughout the tree. Here is what the tree looks like with the garlands, fruit swags and flowers in it. It’s pretty just the way it is but we have about 130 ornaments to put on yet! I have a small collection of larger ornaments. I call them my “statement” ornaments. They go on the tree first. I put one group of ornaments on at a time. That way I can make sure they are evenly distributed around the tree. For hanging the ornaments I do two different things. If there is a string on the ornament, and it is a pretty string I will use it. 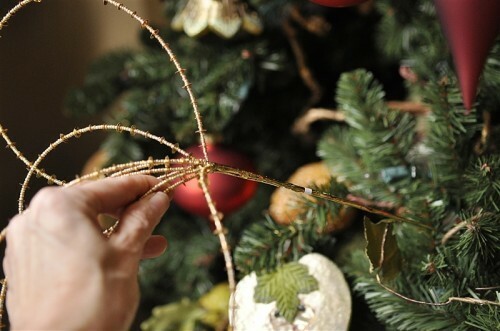 But I don’t like the strings hanging down so I wrap the string around the branch like this…. On ornaments that don’t have strings I do not use wire ornament hooks. I make my own out of green pipe cleaners. They blend right in with the branches and they are so easy to just wrap over the branch. Again, keep stepping back to make sure the ornaments are evenly distributed. I just work my way through all the different groups of ornaments. 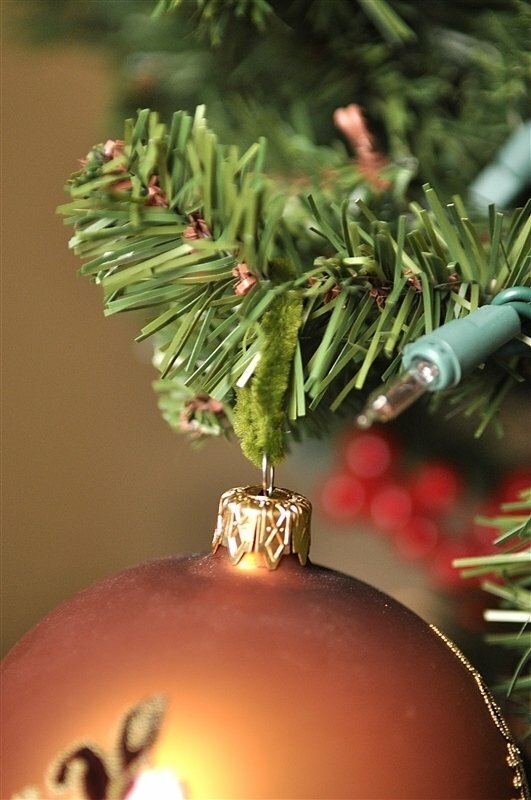 Be sure to tuck the ornaments back into the branches too – don’t just hang them on the ends of the branches. Step Five: Insert final filler. After all the branches are on I have a few more pieces of “filler.” Things I stick into the tree in any empty space I might have. I bought these fun new filler pieces this year at Joannes. Got them in gold and red. I love how they drap down the tree. Step Six: Decorate the top of the tree. I make a bouquet out of some of my filler pieces, flowers and fruit swags to create a bouquet to insert into the top of my tree. I tie it all together with a piece of ribbon and some wire. This step definitely requires a ladder for me! Step Seven: Put on the tree skirt. I don’t use a traditional tree skirt. I have some gold mesh type fabric that I like to just tuck underneath the tree. Costco is carrying something similar this year. Step Eight: The final step is to turn on the lights, step back and enjoy! Any tips or tricks for me? Beautiful and so helpful! Thanks…that will get me going!! The only thing that makes my decorating easier is that my husband made me a 24″ lazy susan out of granite 3cm. I set my tree on it and as I put my lights on someone else turns the tree and I stand still. It works great! That is pretty much a brilliant idea Jody!!! 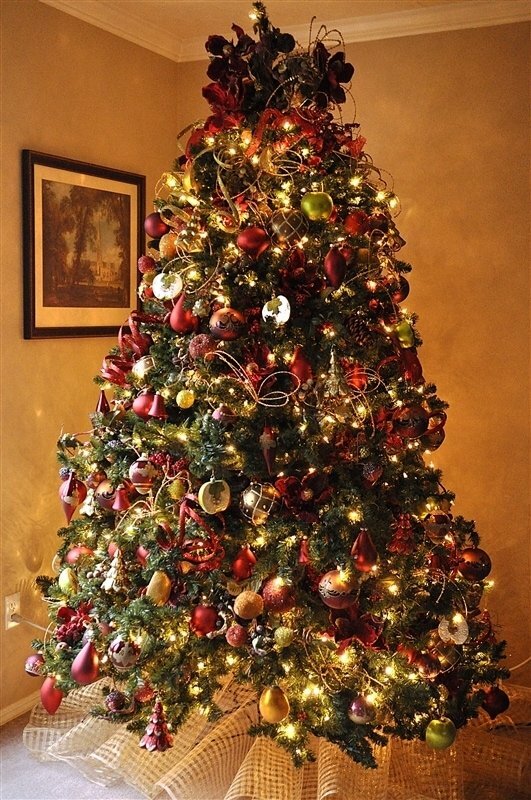 Your tree is beautiful….well done. Your tree is beautiful! Thank you for the tips. I will certainly use these to take my tree to a new level! I have a 9ft tree that would definitely benefit with “fillers”. Your tree is beautiful but it’s a bit much for us. 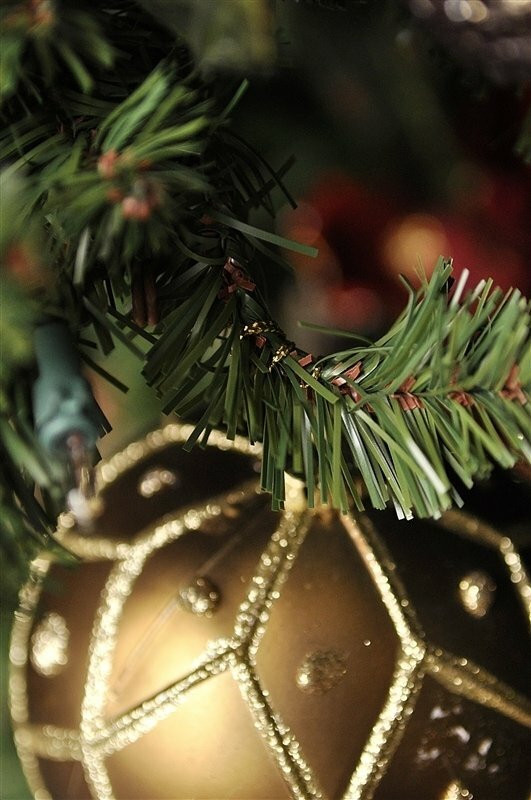 I love fun and whimsical trees and all the fun ornaments the boys put on the tree. We only do one tree so we don’t go all we just let the boys decorate the tree and I don’t like garland or anything on ours. I put garland through out the house. 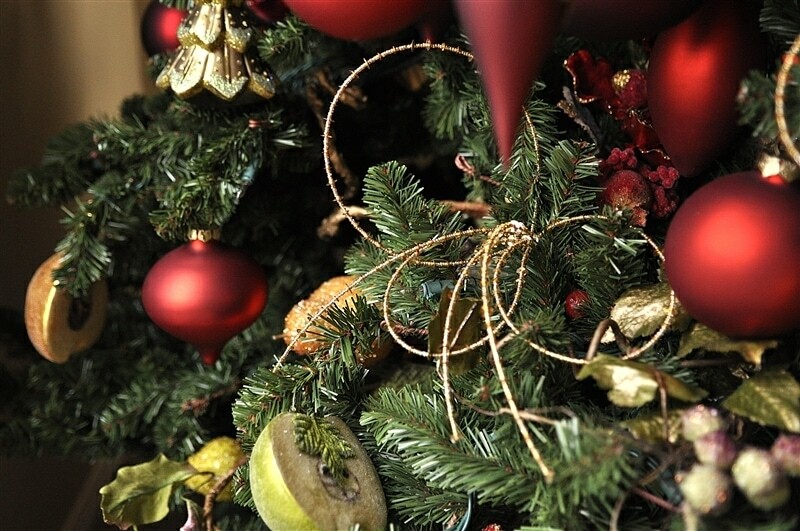 Your tree looks so pretty, just like something out of a Martha Stewart magazine. Amazing job! Maybe once our boys are older I can have two trees. Thank you for the fabulous tutorial. This tree is definitely mom’s tree. The fun, whimsical tree is in the family room. I’ll share it in a post later this week. WOW! Beautiful tree and lots of great ideas. Thanks for sharing! Love it, Leigh Anne!! I never thought of all the additional stuffings…very cool! What a beautiful tree! Thank you for sharing. Great tips and a beautiful tree. Beautiful tree and great ideas! I love the green pipe cleaner idea. Sorry, I don’t mean to change the subject, but I also LOVE your painting in the background!! Is that Salisbury Cathedral by John Constable? It’s one of my favorites. My husband is a BYU professor and we did a London study abroad and that’s one of the cathedrals we went to see. We had another painting from the same artist in our flat. Trisha – I’m Leigh Anne’s mom. I love the Salisbury Cathedral one of my favorite places in England. John Constable is also one of my favorite artists. Have you read Edward Rutherfurd’s book “Sarum” it’s lengthy but fascinating. Wow! I just looked it up on Amazon and it DOES look fascinating:) I’m definitely going to read it. One thing they say it discusses are the Barrows…burial sites. You can see these all around Stone Henge. Just little hills or mounds, but knowing what they actually were made them interesting. Thanks again! Trisha – looks like my mom answered your question that yes it is! My daughter Tessa just got accepted into the BYU London/Theater study abroad program for Spring term. I’m saving my pennies so I can go over and join her at the end and I hope to visit Salisbury Cathedral while I am there! What an amazing experience for your daughter! London is a great place for theater:) We were just in the “normal” study abroad program, but saw many plays. We saw the theater study abroad students at church every week. They were in our ward that meets near Hyde Park. I don’t think Salisbury Cathedral is far from Stone Henge…if I remember correctly. Within an hour?? England is so cool! 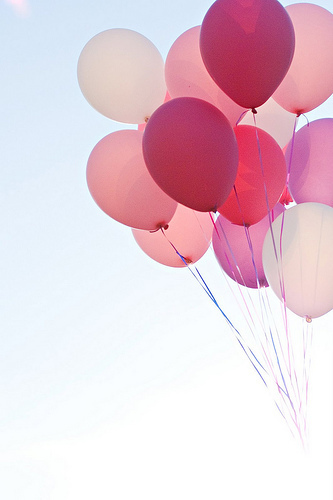 I hope you have a great time. Wow! It’s my husband and I’s first Christmas and it was quite the ordeal to decorate our little tree. I really figured out Pinterest because I wanted some tips on how to make a skeletal artificial tree look more full and beautiful. I’ll be scouring all the craft stores after Christmas for next year! That is the most beautiful tree ever!! 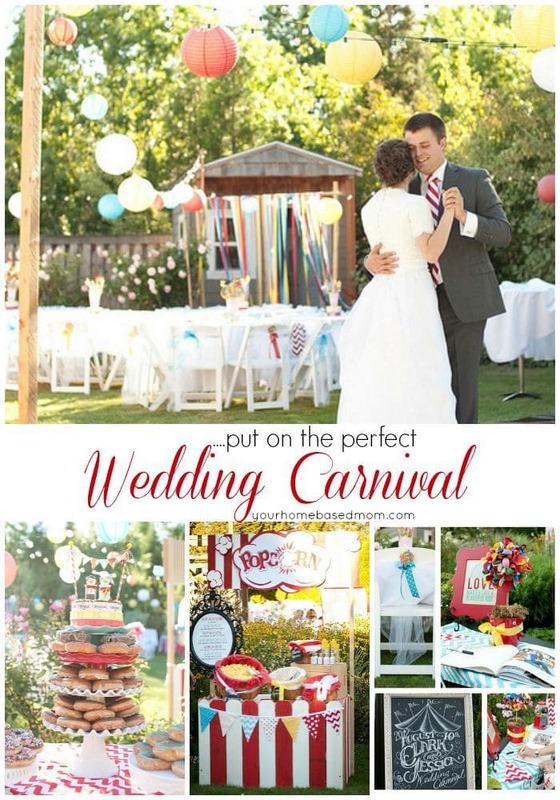 I never would have thought of the garland, fruit, fillers and such! 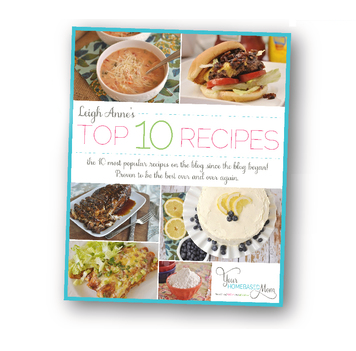 Can’t wait til next year so I can try some of your ideas!! Thanks! At our house we have “my tree” and the “family tree” as well. My tree (also 7.5 feet) is a bit over the top as well. 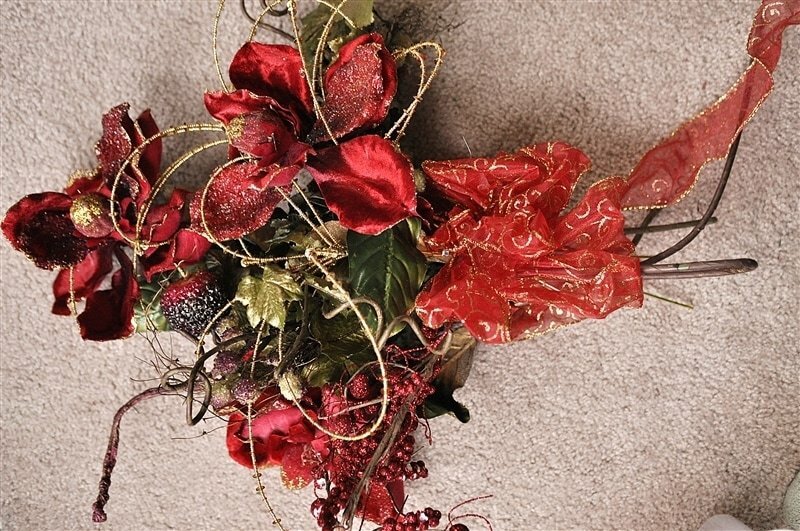 I start with ribbon (4 spools of a green and 4 spools of red), then add flowers – filler – twiggy things – etc. , then I add a santa (he is about 3 feet and sits tucked into the branches, then add my 175 ornaments making sure I get some tucked back into the branches so the lights can dance off them, and top it all similar to yours. I just love having a fancy tree to go with a “charlie brown” tree that has the ornaments created with lots of love. You and I have the same idea of what lights on a Christmas tree should be. If I had my way, I would add more to the pre-lit tree we have. Such a pretty tree!! This is my partner and my first Christmas and we have VERY different ideas on what a tree should look like. He prefers a very colorful tree with multi color lights, bows, and several colors of bulbs. 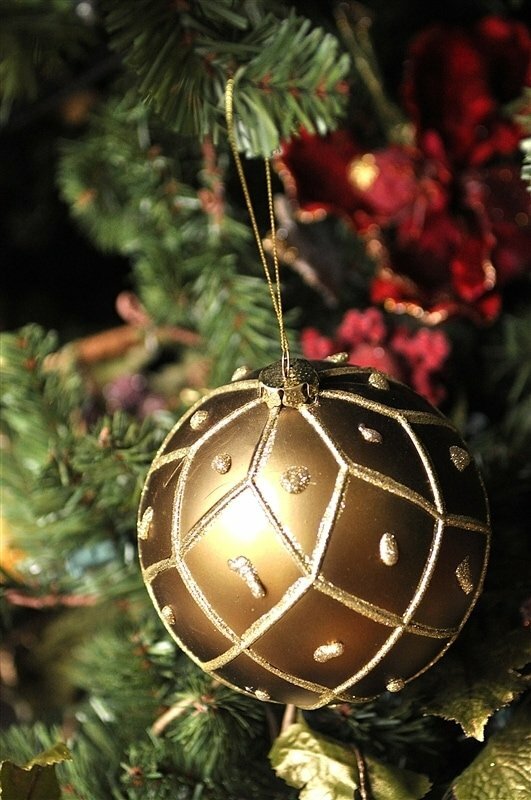 I on the other hand prefer a more traditional tree with darker reds, greens, and gold tones and simple ornaments. The house we bought has room for five trees and we each took two with the agreement that the one in the family room will be done by the both of us. So the room will have a fourteen foot tree that is pre lit already with clear (and multi color lights that will never be used). So my question is what kind of ornaments and style/thyme should I do that will make both of us happy? I also have no clue how many ornaments this should take since it will be in the center of the room and will be seen from all sides. Any advice you have would be greatly appreciated. I love this tutorial, even do I might not have to buy all that I looks so pretty and the tutorial is so helpful for me, thank you so much. So beautiful!! Wish my Christmas tree would turn out like this!! that is a beautiful tree and you definitely have kept me from hiring a tree decorator. thanks ma’am. I LOVE it! We do a mix of real and fake. Although I don’t think our big fake guy made the move. (We ran out of space on the truck and started giving all our stuff away!) We’re excited to check out a Christmas tree farm this year but I’m bummed that Thanksgiving is sooo late. Leigh Ann, Beautiful tree. Just bought a house in South Carolina and it will be our first Christmas there. 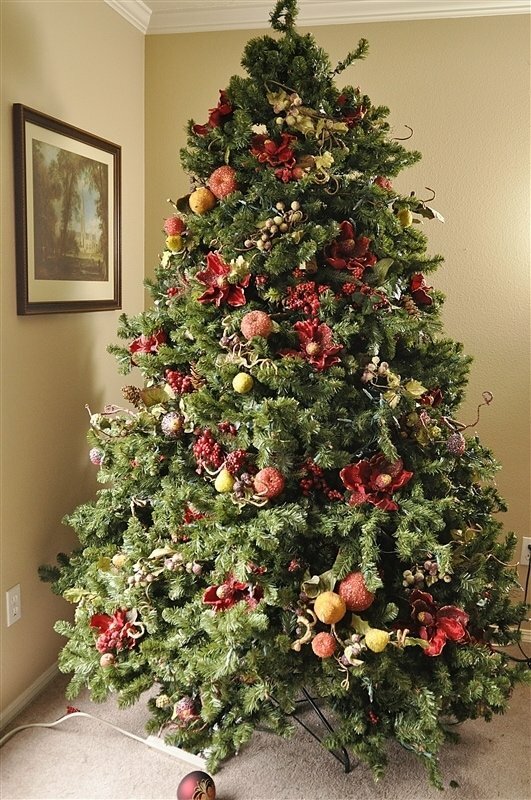 I will be getting a 7,5′ tree with lights, but I will probably add more.. Love the idea of adding fruit , flowers and fillers. I always try to find ways to fill them, now I know how. Thank you for the tutorial, very helpful and creative. Have fun with your new tree and your new house! I have the same beaded fruit on my tree! Got it 15 yrs ago on qvc. I have probably had mine that long too – love it! I just wanted to thank you for being very specific, it helps a great deal. Growing up I didn’t have the greatest childhood, so when I had children I always envisioned me how decorated like in holiday movies. While I have gotten close, each year I try to get better and better. Do you have any advice on hanging lights? Thank you again, your tree is absolutely gorgeous! My advice for lights is use a lot and be sure and get them into the center of the tree too – not just on the outside edges. We use a LOT of lights and on our artificial tree and kind of wrapped the lights around the branches of the tree to mimic pre-lit trees. It usually comes out great!! I used to “wrap” my lights around the tree in a circle; however, I learned to put the lights in the center of the tree branches outward which gives the tree a 3-D affect. I love to sit by the tree at night with all lights off except the tree and enjoy the depth and illumination of the tree with the lights going from center to outer branches. There’s just something magical about Christmas time and remembering the greatest gift of all, our Savior. Merry Christmas to you and yours. Thanks for sharing your great tip about the lights! It is a magical and special season isn’t it. You are so right Karen. From the time the tree goes up at our house, we hardly ever turn the overhead lights on because the tree lights are so beautiful and mystical we don’t want to spoil the mood. 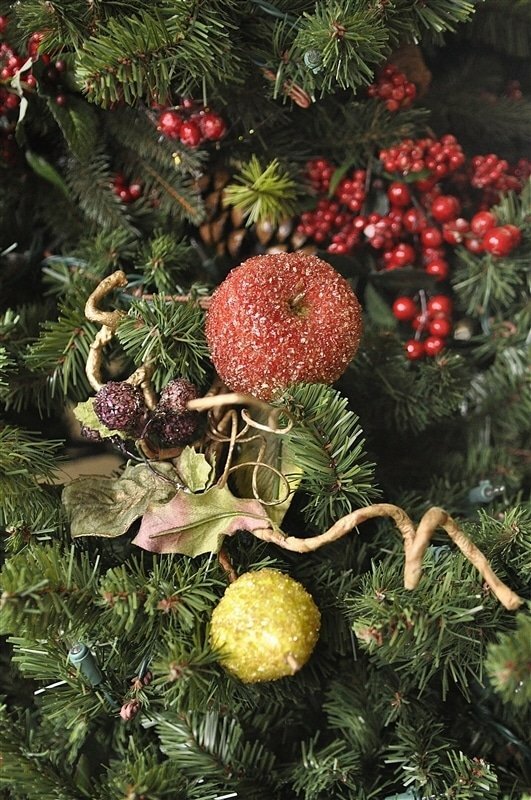 Hi was wondering where you found your fruit sliced ornaments, I have been looking all over with no luck!! I got them years ago from an Interior Designer. Sorry I’m not much help! Wow, I decorate my tree I. Almost the same way, with the same type of ornaments. 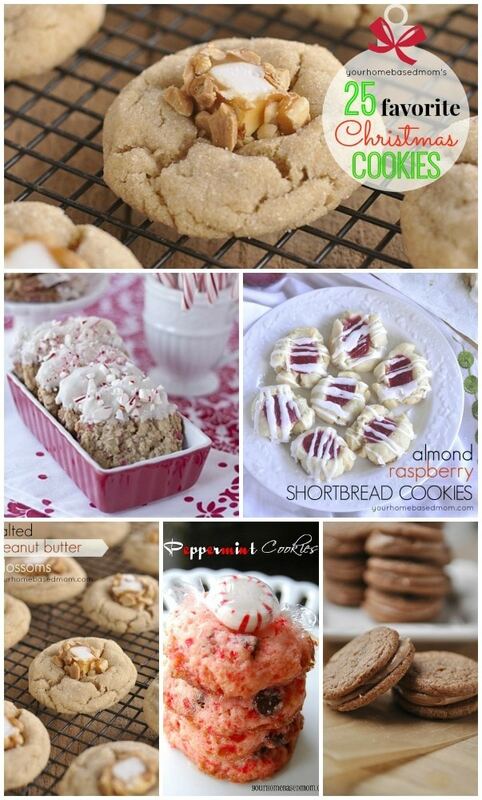 When you decorate them like this the look like the trees you see in the department stores during Christmas. In addition to my real gifts I place under my tree, I also wrap empty boxes in red and gold shinney Christmas wrapping paper and place them under the tree for a full look. Love the idea of some pretty empty packages under the tree. I always buy my wrapping paper to match my tree! I forgot to say that your tree is very pretty. Since you do five trees I think I am going to put one in my bedroom, in the corner. Great idea. Thanks! Love having trees in the bedroom. It makes a great night light. You do a great job! I friend and I are Christmas junkies, we look all year for Christmas stuff. We started attending a “Yule School” which taught us how to decorate tress. This company sold the coolest stuff, but went out of business. We are lucky enough to have to have Ralph Jones Christmas store, who decorates for all the hotels here in Las Vegas, NV. One thing we were taught was always buy and use things in odd numbers. We also use “Stick ins” which you are using flowers etc. I have my stick out more. 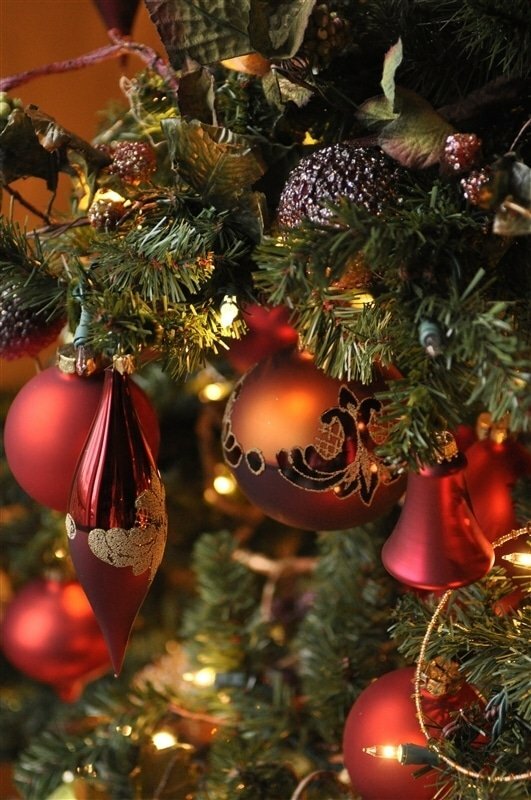 I wish I could send you a picture of some of my Christmas decorations…. I have an artificial tree as well. I fluff each branch before I put it on. Once I get a whole row, or level, of branches on I add the lights. I start at the end of the branch closest the trunk and then weave over and under each little twig toward the tip and then go back toward the trunk the same way. This really hides the wire of the lights. I do each layer of branches this way so I never have to shove my arms between those scratchy branches. Ouch! 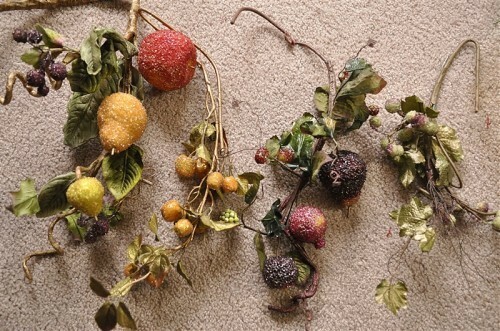 Where did you find your fruit swags? I have had them for years and found them at a craft store here in Portland. Your tutorial was very inspiring–I do many of the same things you do–nothing is bare when I’m finished. The one thing extra I do is wrap a string of lights in and around my topper. At first my topper was dark like yours is and I wanted light all the way to the top, so I took care of it by adding one more short string. Great idea – I’ll be adding lights to mine this year! Glad you enjoyed the tutorial – I am redoing my tree this year so maybe I’ll some more tips for you! 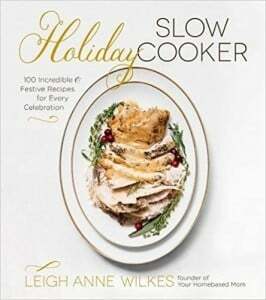 Thanks for this Leigh Anne! I always get stumped on how to add fillers and group my ornaments. Now this year I have a plan! Thanks Beth! Have fun decorating your tree this year. I love your tutorial and your tree is amazing! 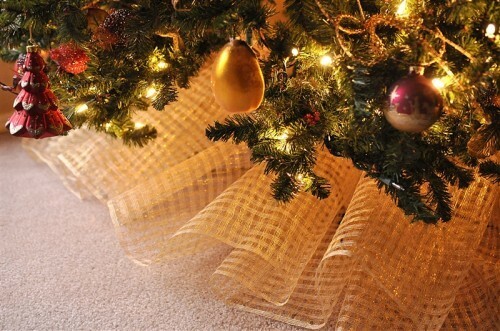 I typically use deco mesh in my trees and I want to use filler garlands in the tree like you suugest, so I was wondering if you would put the garlands or the deco mesh in first. I haven’t used deco mesh but I would probably put the garlands in first and then the deco mesh. Have fun decorating! 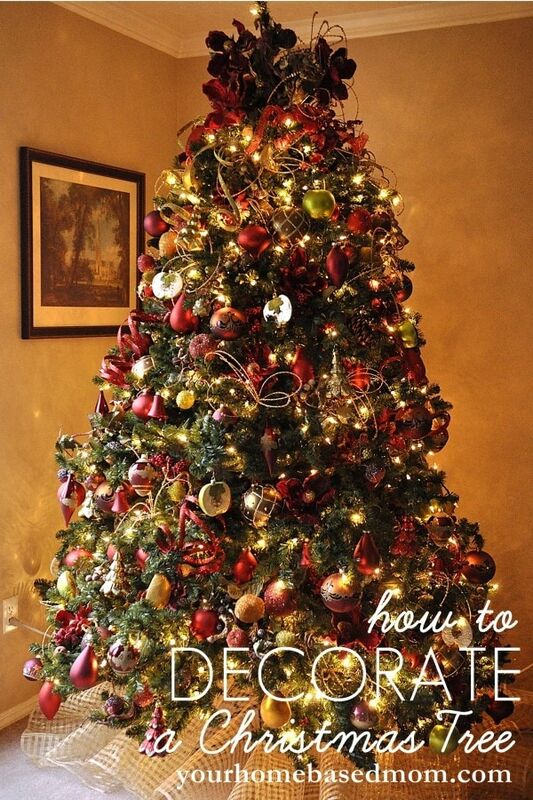 The best tutorial I’ve found on decorating a tree! Thank you for being so detailed. My tree is a different style (think pine cones, neutrals, and burlap instead of fruit, reds, and garland) yet following your layering steps made this the best tree I’ve ever done! And the trick with the pipe cleaners is genius! I’ve got a two year old and he can’t get the ornaments off as easily so he has already lost interest 😉 Plus, I feel as though my glass ornaments (that I put up high away from toddler fingers) are much more secure than just using the store-bought wire hooks. Your tree sounds beautiful! I do love the pipe cleaner trick – it’s the best!! Pipe cleaners instead of ornament hooks = sheer brilliance!! Totally going to do that this year. Love love love your tree :). Amazing!!! !… Everyone know that as soon as Halloween is over I get extra excited about Christmas. I thought I had the ultimate tree until I saw your tutorial. 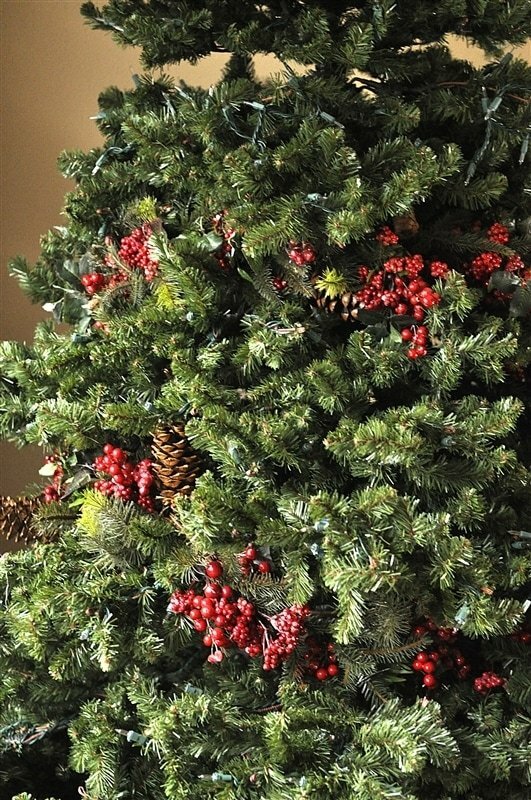 Great ideas, however, I use a large vase or Urn as my base, to give my tree (7ft) some height- we have vaulted ceilings. I will definitely use some of your techniques! Merry Christmas!!! 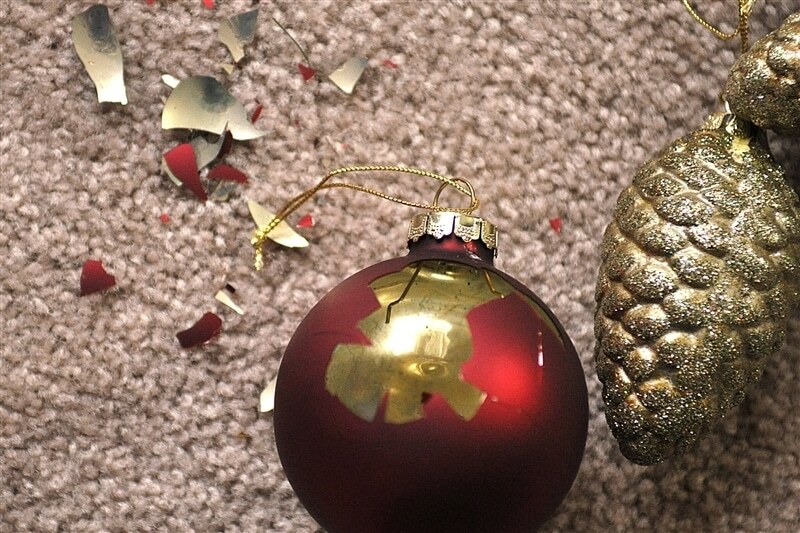 Have fun decorating your tree this year. Love the idea of using a large vase to put your tree in. Your tree was a joy to see! I need some advice on hanging a garland of icicles. Out tree is all blue and white with fun white feather boas and snowmen ornaments. We had a party the first two years of our marriage and had friends bring a snowman ornament… 20 years later we remember every person through each one! But I can’t get the icicle garland right! My boys and husband love it so I can’t “accidentally” toss it, either:) Any thoughts? Not knowing what the garland looks like it is a little hard to give advice but if it is large I would put it on before I put the ornaments on. I love the idea of having your friends bring you an ornament. Such a great idea. Thanks Linda. Your trees sound wonderful! I have a favorite artificial tree. It was a little small for the house we are now living in. I had hubby build me a base/box, about 4 ft X 4 ft and 1 foot tall. I place my tree on that box and it really makes it stand out. And so far no one has noticed the box, (I put the tree skirt over the box ) they just notice how pretty the tree is. I also like to use lights as decorations. whether I am using clear or colored, I choose different styles, sizes and textures. It really adds a lot to the tree. I personally like to have 1 strand of lights that twinkle, while all the others remain on. 1 Strand doesn’t overwhelm the tree and gives it a little extra something. I don’t always use Christmas ornaments on my tree. it depends on my theme. I have used small toys, small stuffed bears, whatever my theme is for that tree, for that year. Your tree is beautiful, thank you for sharing. Thank you! 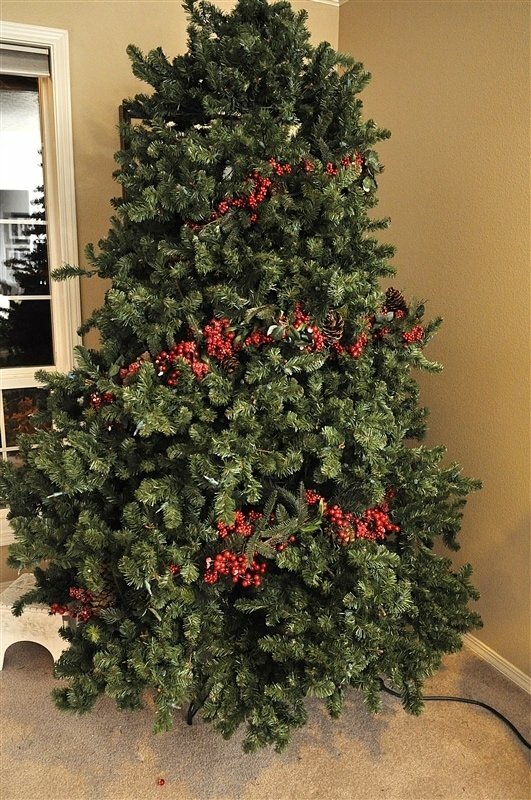 I’ve had something very similar floating around in my head…I just wasn’t sure how to make it work on my tree. My tree is already up this year (rats!). I’ll be keeping my eyes open for great decor for next year’s tree. You made my morning. Thanks again. Glad you found and liked the tutorial! I hope you know you have filled a REAL need. Every year I go to the mall and see all the beautifully decorated trees and wonder how the heck they DO that. I come home and look at my ho hum tree and wish I had the “recipe” for a beautiful tree. I always say there is a trick to everything if you just know what it is. Thank you for sharing your little tricks with those of us who are less saavy. Thank you so much Cheryl! I am so glad the post was helpful to you. I love the process of decorating my tree each year! I LOVE your tree, it’s amazing! Your tips and tricks will come in handy for next year’s tree (God willing). We always have a natural tree but I am seriously thinking of getting an artificial tree for next year. Would you mind telling me where you purchased yours and what type of tree it is? Do you know where you got your tree. I am looking for a very full artificial fraser fir and it looks like your’s might meet my very high standard? I got the tree in this post from a decorator years ago, no idea where it came from. I bought a new tree this year from Balsam Hill that I love. Just gorgeous! Thanks for all the pictures and the great tutorial. I don’t think I would have figured it out without it. Definitely will save and try next year and lose the outdated look I have now. So appreciate the time you took to present this! Laura, SO glad you found the tutorial helpful. Is there a way to make tree stand out more for daylight hours? Six trees. Needless to say, so many ornaments, too many to count. The fillers as you did, do you think the will show better, have more wow power or do you feel more lights? 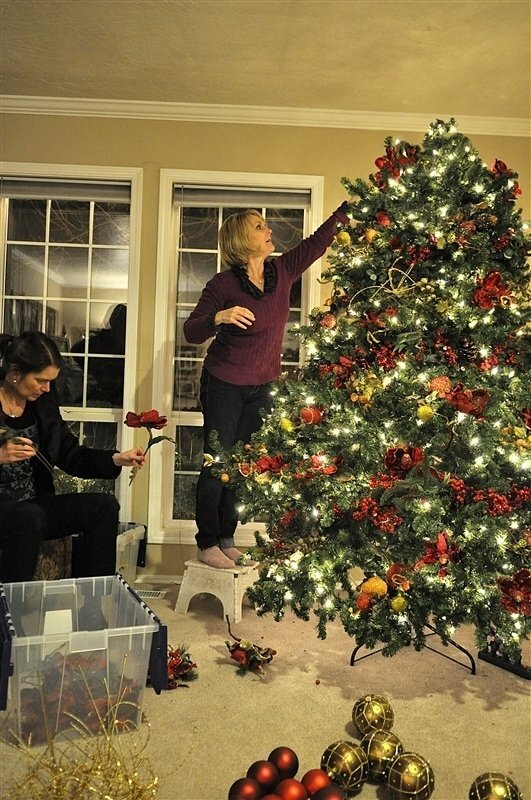 Tonia, Great tip – will definitely remember that when I decorate my trees this year. Your tree is gorgeous! And thank you for the great tutorial. I have a similar routine, but being disabled, it takes a whole week for me to get it all done. But it is well worth the time! I LOVE your style! i’m wanting to incorporate vertical ribbon into my tree design this year. Using tartan plaid red ribbon plus others that coordinate. Any tips? 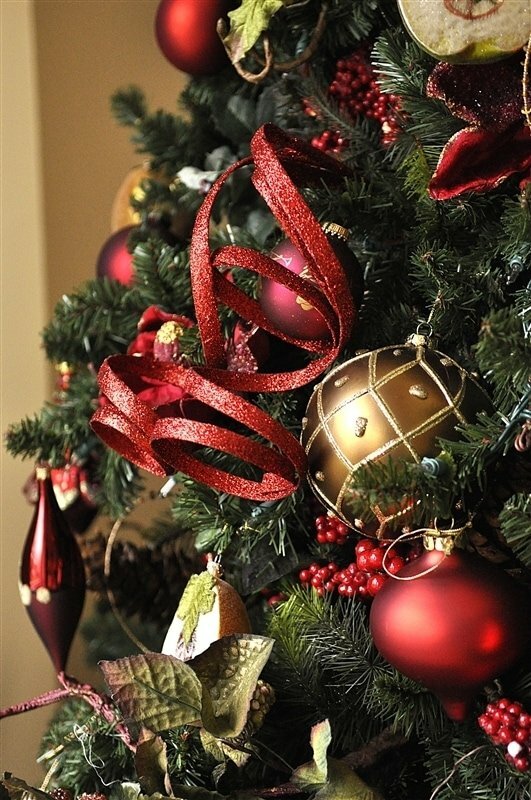 I think plaid ribbon would be great – I would look for wired ribbon so that you can shape it as it hangs down the tree. Your tree is gorgeous. Where do you buy the poinsettia flowers?? 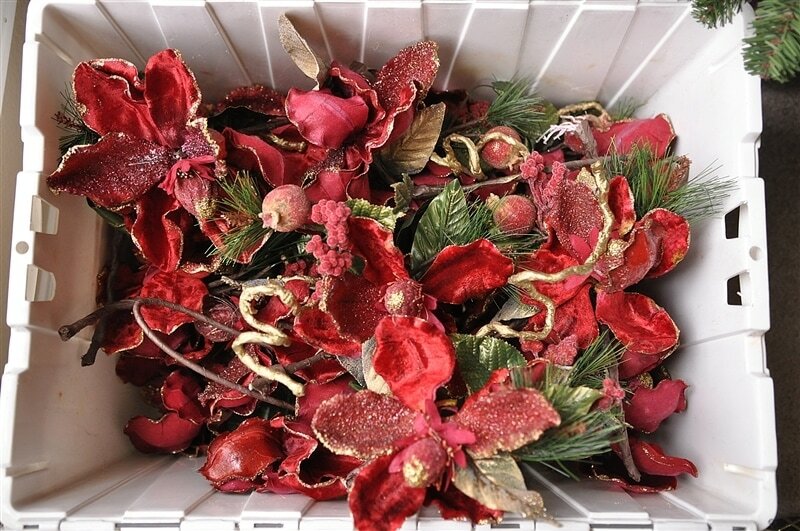 I have looked at Michaels, AC Moore, Walmart and can only find “poinsettia bushes”, no single flowers. Karen, I purchased mine at a store in Utah called Tai Pan Trading. 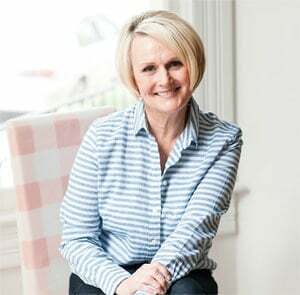 Do you have a Joann Fabrics near you? You could check their floral department. Filler garland? Didn’t know that I could add that to the tree make it look fuller. Headed to Hobby Lobby in a little while and will pick some up. I may even take a before and after photo. Kenya, Filler garland really helps fill in the tree. Have fun decorating. Leigh Anne: I just wanted to thank you for your brilliant decorating tips! I read your post a couple of years ago, and the tip on using filler garlands changed my tree TOTALLY! I was stunned at how much the garlands fill in the tree and really kick start the decorating. 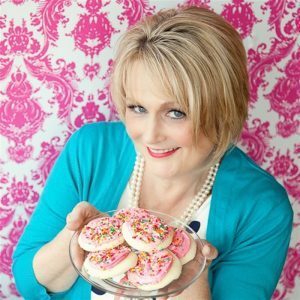 So thank you so much for sharing your decorating knowledge and helping me learn to be a better decorator! Julie, Thanks so much for letting me know. I am glad that the post was helpful!! Can’t wait to get my tree out this weekend and start decorating. 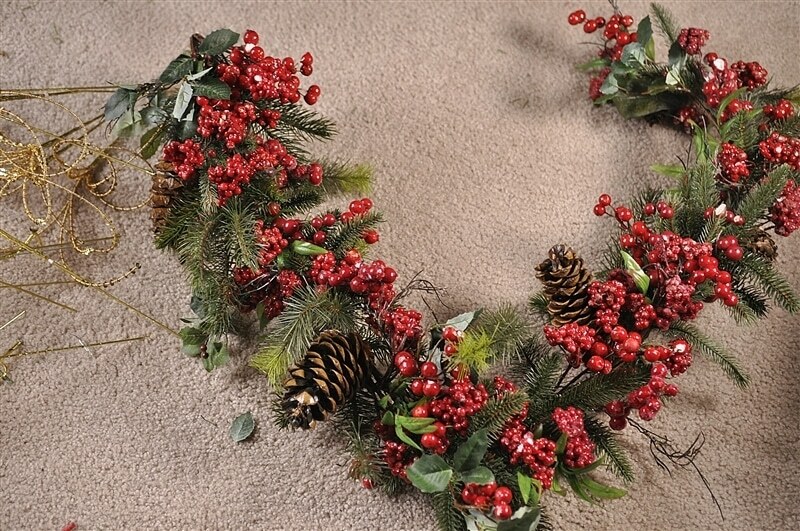 Where do you get your berries/cone garland, fruit swags, and poinsettias…they are so pretty, haven’t seen anything like these at the stores. Caitlin, I have collected them over the years. I have found quite a few at Michaels Crafts and also at Tai Pan in Utah. I came across this post last year when I was totally crazy frustrated with store-bought Christmas ornament hooks . Your use of green pipe cleaners was a total lifesaver! I have and used green florist wire and it works beautifully! Thank you so much – you have literally changed how I decorate my Christmas tree for the better…MUCH better! I am posting my Christmas post (yes – a bit late), but I am including a link to this post so more people can be helped! Thank you again! Kristine, I am so glad you found the post helpful! Thank you so much for your kind comment. I really appreciate it. Merry Christmas!